We are one month from the dividend income showdown in December. Yes, this month marks the preparation for the biggest dividend month of them all. Reviewing this current month’s dividend income results, reminds me that all of the hard work throughout the year is about to enter the dividend portfolio. November was a great month. There were unexpected news on dividend increases, as well as improvements along the way. Outside of this past month being freezing, with slight snow and too many leaves, collecting dividend income has warmed up my days! It’s time to dive in and review the results. I received a total of $538.65 of dividend income in November. Another record, no doubt, but not by much and wasn’t as strong of a dividend earning increase versus other competing months. However, it’s in the green or positive. Further, the 401(k), Health Savings Account (HSA) and all dividends are automatically invested/reinvested and helps take the emotion out of timing & making a decision. Also, to find out why I max out my 401(k) and HSA – please refer to the 3rd part of my tax series, (though I have the breaks on the 401k, as I recently posted due to the 6 month waiting period, only a little over 1 month of waiting to go!) as that describes the magnitude of benefits to increase the amount you can invest due to reduction in taxes. 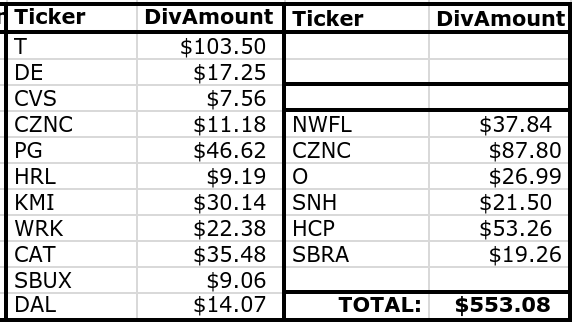 Here is the breakdown of dividend income for the month of November! AT&T (T) came in with the triple bagger in dividend income, crossing the $100 barrier mark. What is wild with T, their stock price is absurdly low for that dividend aristocrat, with a dividend increase looming. Can they cross the 7% yield threshold? It’s getting awfully close. The Kinder Morgan (KMI) dividend is looking really nice coming in, as well as the reinvestment as such a low price – grabbing almost 2 shares on this DRIP. Also, I am getting SO close to earning over $100 from Citizens & Northern (CZNC), when adding up the dividend income from both types of accounts (i.e. taxable and retirement); I know this will cross $100 going forward, which is exciting. In addition, my purchase in Starbucks (SBUX) is starting to show the dividend, as well as their 20% dividend increase from earlier this year. 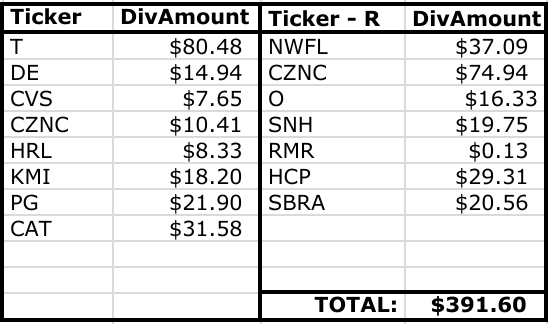 Similarly, I have split out between the individual stock amounts and the retirement accounts, as the ” – R” indicates a retirement account dividend (or the furthest column to the right). I separate these two, as I like to know what portion of my dividend income is coming from those retirement accounts that I cannot touch until 59.5 (barring any other usage rule I could use). Here, it shows that I received a total of $246.65 (up from $198.11 last year) or 44.60% of my income from retirement accounts and the other 55.40% was from my individual taxable account portfolio. This ratio also has stayed fairly consistent, with a slight increase to the taxable account (which I like). Additionally, this shows from retirement accounts that I’m all ready for my set it and forget it mentality to keep that income going. To see my portfolio – one can go to our portfolio summary page. Now, I will compare the previous year’s linked month to this month. What’s not included in last year’s, is a one-time dividend of $112.11, as it’s not a typical amount. Therefore, when including that one-time dividend to November 2017 (to be conservative), my dividend income was up 9.80%! My goal is to be well over $600 in dividend income next year. Starbucks was a new name, as well as WestRock (WRK), both increasing their dividend in the time I’ve owned them. Lastly, dividend increases and reinvestment fueled the other dividend income growth, with no dividend cuts. Dividend increases this month did not disappoint! 4 companies lined up November with dividend increases. The BIG surprise here is First Energy (FE) making that come back with a 5.56% increase baby! Hormel (HRL) did not disappoint with their double digit banger, but Emerson (EMR) stayed on their molasses pace of… 1%. However, that wasn’t the only surprise, as ANOTHER company decided to increase their dividend twice, with Rockwell (ROK) adding another 5.44% to that forward payout. Four companies in November is solid and In order for me to add $20.28 to my dividend income, I would have to invest $579.43 at 3.50%! The name of the game is to learn and act in the right manner. Then, using what you have learned, in order to trend where you want to be. The plan is to maximize every dollar for investment opportunities and live a balanced life. My plan is to show that dividend income can act as a revenue engine to take back control of your life. Dividend investing, once you learn the right way, becomes easier and starts to make quite a bit of sense! As I discussed in my normal monthly expenditures article, the dividend income would cover almost 55% of my average $984 monthly expense, which includes the mortgage, property taxes, insurance and utilities. This shows promise and as long as I keep those expenses in check, this coverage will continue to grow bigger and closer to the 100% mark. What a month, everyone, what a month. In similar fashion – all of the investing from last year and moves this year, shows that my aim to save 60% of my income, and making every dollar count, has allowed promising results already this year. Did you enjoy your Thanksgiving? Spend Black Friday investing into dividend income stocks, for when the market was open for the half-day? I hope we are all making every single dollar count, as we march towards the final month of the year and the final month to reach our 2018 goals! 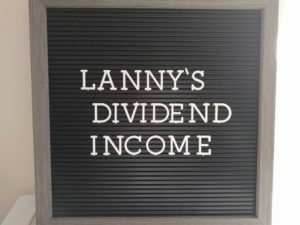 Please share your dividend income thoughts below, as well as anything else you are noticing or seeing from my results. Thank you again, good luck and happy investing! This entry was posted in Monthly Summary and tagged AT&T, Citizens & Northern, CZNC, Dividend Income, Rockwell Automation. Bookmark the permalink. Appreciate it and that’s the gosh damn goal. What about $700? What do ya thinK? Can I DO IT?! I need that competitive nature to come out! Check your excel, it’s true..
It’s always interesting to see your monthly performance. And it looks like you had another strong month. Congrats, Lanny! May seem like little, but the dividend growth rate is fantastic. Nice work, 500 dollars in one month is no small achievement! Congrats on the dividend increases too! Appreciate the comment and great catch – I have updated/fixed!! Way to up your numbers. At this rate you will be looking at more than 10k/yr in taxable divs. Yuge. Always great seeing your progress. Having a record month must feel great even if you just beat your previous record. With that huge T dividend I’m reminded that I still have some room to add to that name going forward. As always, it’s nice seeing quite a few common names paying us. You are also making some good progress in covering your expenses. Before you know it, 60%, 70% and more will be covered by passive income. Keep up the good work. Always a pleasure having you stop by. When will we not have record month? Well, never I hope, haha. If you have room to add – these prices have been fairly decent and they have a potential dividend increase coming, as well. Thank you and getting over $100 from a single company is rare for me and is, yes – awesome to see haha. Talk about a journey, as I remember getting far less than that, but in time – you get there. Amazing November, Lanny! And the growth rate compared to last year is exceptionl (excluding that special dividend). Yeah, almost a 10% growth rate is solid and hell yeah – those 4 dividend companies are awesome, talk about 4 industries that you have right there – rock solid. Congrats! Very solid month Lanny, and it is great to see those dollars doing work for you with the raises and reinvested dividends. I share five companies with you this month, and I am with you in working to push this up to the $600+ milestone as I just crossed $500 (by a hair). Here is to a strong finish to the year for all in the community! Hell yeah! LET’S GOOOOOO!!!! Hey, you crossed $500 and you’ll easily cross $600 this time next year, the way that you’ve been adding capital to the engine. Let’s kill it. Nice work! November is priming the pump for what is sure to be a great month for December! Thank you for the comment, and agreed – priming that big pump baby!! Congrats on yet another personal best! 10% YOY growth is very solid and impactful working with the numbers that you’re working with. Thanks for the comment, as always – I appreciate it. Wish I could cross the 10% threshold this month. Looking forward to what December shows. Five… Ben Franklins! Four divvy raises, Three new payers, Two growing accounts, and a big smile on Lanny’s face. As you can see, I’m already into the holiday season. 🙂 Let’s crush December and finish strong, Lanny! Feeling the holidays, eh? I love it so far. And dayum – you are right and I wish I had more big divvies! Let’s do this!! Nice Lanny, so many div’s with a nice side of raises. Got to love that T payout, man I got to start a position in them at these levels! Especially considering, how crappy this month of the quarter is for me. You had an awesome month and you have SO many revenue streams, it’s fricken unreal!!! Further, you’ll get there, and it is funny seeing > 3 digits on one dividend payment : ) Takes time, but it’ll happen!! Good job I’m late in getting mine out. We share T and O and SBUX good dividend raises this month for you. Isn’t it great to see the amount pay more and more of your bills? Keep it up? Nice – Love “O” – their quarterly increases are amazing. Also – SBUX rate of dividend increase is just phenomenal. Thanks for rolling by!